Vaccines are designed to protect your pets against deadly and contagious diseases. Not all vaccines are given to all animals - while some pets will require several vaccines, others may require less. At Citrus Veterinary Clinic, every pet is given an individualized vaccination schedule based on the breed, age, health needs, and lifestyle. 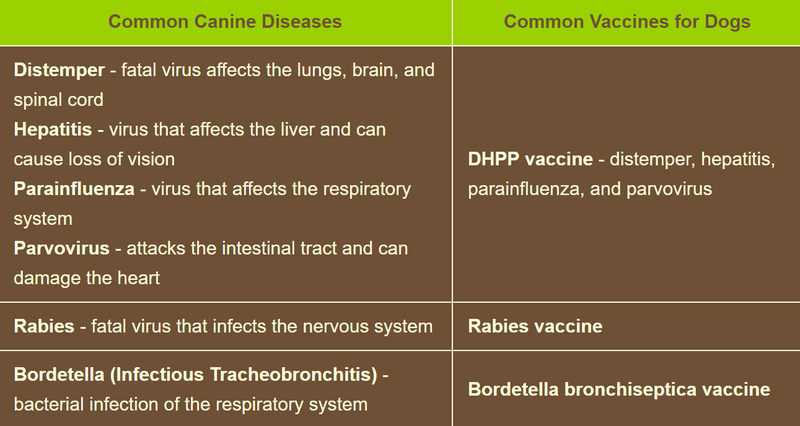 The following charts offer some typical pet diseases and the vaccines we use to protect against them. Please remember that your pet may not receive all of these vaccines; this information is for general knowledge only, and your veterinarian will be pleased to discuss the specific needs of your dog or cat at your next visit.